With great pride, we present the first prize winners of our school. 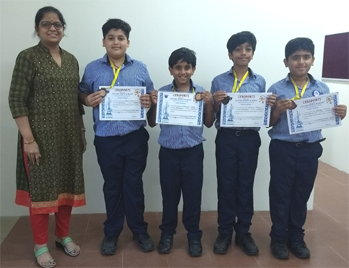 Our team of swimmers comprising of Aarit Singhania & Hryday Chelwani of grade 5 and Vishwajeet Chopde & Shivamm Agrawal of grade 6 won the bronze medals in the 4X50m freestyle swimming relay in the recently concluded ‘Censports’. The inter-school sports meet held from 23rd to 25th July 2018 was hosted by Centre Point school, Amravati Road Bypass and saw a participation of more than 45 schools. Our swimmers were lauded for their excellent performance. We congratulate all of them and wish them many more victories in the future.